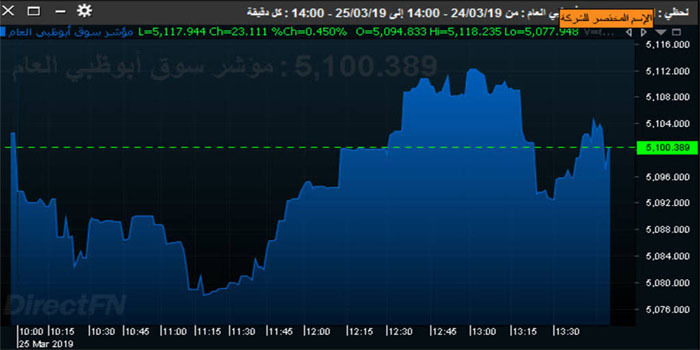 The benchmark index of the Abu Dhabi Securities Exchange (ADX) closed Monday’s trading session in the green zone, endorsed by the rise of both the energy and real estate sectors. The main index added 0.45% or 23.11 points to close at 5,117.94 points. Liquidity amounted to AED 165.26 million after 62.77 million shares were exchanged through 1,504 transactions. ADX’s market cap gained AED 1.66 billion to reach AED 512.550 billion on Monday from AED 510.892 billion on Sunday. The energy sector topped the gainers with 1.30%, backed by Abu Dhabi National Energy (Taqa) which added 9.41%. Meanwhile, the services segment led the decliners with 3.22%, dragged by Abu Dhabi National Hotels which lost 6.67%. The telecom segment retreated 0.12%, in line with the fall of Etisalat with the same percentage.